Today we're going to talk a little more about two features of audio mixing boards. Specifically, we're going to dig into the nitty-gritty of Groups, VCAs and DCAs. I often run into confusion about these similar, yet different technologies, so hopefully this post will shed some light on the subject. First, we'll look at the ways all three are similar (and for now, I'll use the terms VCA and DCA interchangeably). In a live mixing environment, Groups, VCAs and DCAs all exist to help you control the level of a group of inputs all at once. They go about it in different ways, but that's the idea. Take a bunch of inputs, say 8 drum kit mics, and put them under the control of one fader. This allows you to quickly adjust the level of the entire group quickly, and without changing the relative balance between the individual channels. 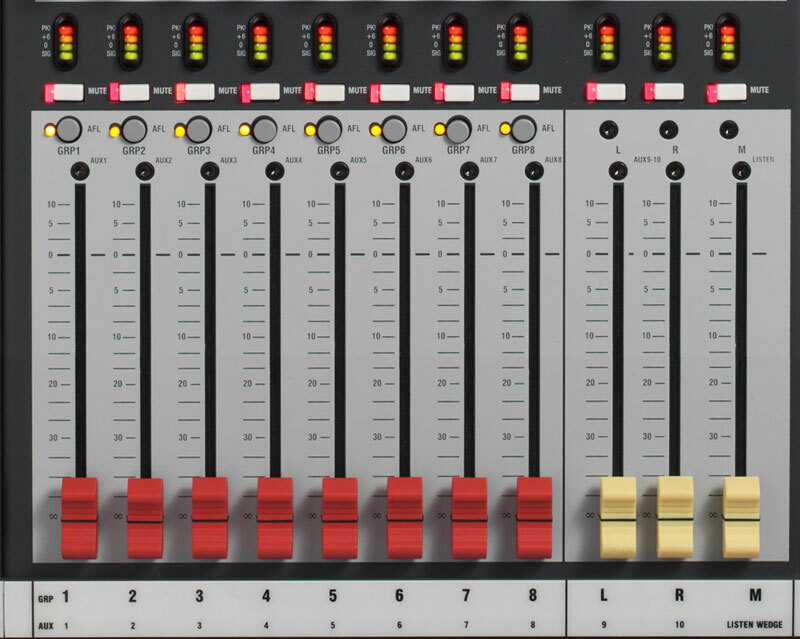 A group is essentially a mixing bus. A group has it's own little amplifier and a way to aggregate all the channels assigned to it into a single output. Higher quality boards can handle a whole mess of high level (0 dBu to +10 dBu or more) without overloading. Lesser boards are saddled with groups that start to overload a much lower levels. When you send a channel to a group, the signal leaves that channel at the level set by the fader and enters the group. The group fader then alters the level of all the inputs into that group. In a big-picture sense, the L&R busses on your board are groups (at least they perform the same basic function). The difference is that a group typically sits between the individual channels and the main L&R (or mono) output bus. Most groups also have dedicated outputs on the back of the board, but if your board lacks VCAs, the most common use of groups is to sub-mix a set of channels before sending them to the main outputs (again, L&R or mono). 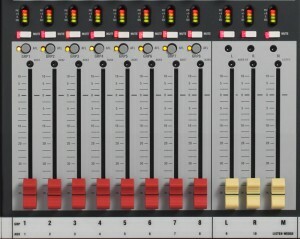 For example, when I was at my last church, our FOH desk (a Soundcraft Series Two) had 32 channels and 8 groups. We configured the board thusly: Group 1--speaking mics; 2--vocals; 3--drums; 4--guitars; 5--keys; 6--brass or choir; 7&8 stereo inputs. So, with this configuration, it was super-easy to turn the drums down a bit, because we simply lower group 3. Raising the level of the vocals could be accomplished by pushing up group 2. And because most boards that have groups have inserts on those groups, we could put a compressor on an entire group if we wanted to. I almost always had a compressor on my speaking mic group, mainly because I didn't have enough compressors to give everyone their own. Throwing it on the group let me compress all the speaking mics, and keep the levels under control with minor tweaking. It's not ideal, but it's better than nothing. The problem with groups is that it adds an additional step of amplification/processing inside the board, and that creates noise. A well-designed board will minimize this, but it's there nonetheless. You're also a bit limited in what you can do with groups (at least compared to VCAs, which we'll see shortly). There's also the issue of group muting. Typically, when you mute a group (or in some cases, un-assign it to the main bus), you only shut that group off in the house. The monitor sends for those channels are still on. If you're all on ears, this isn't a big issue. However, if you have wedges on stage, you'll still get noise out of them when you don't want it. To clean that up, you'll need to use a mute group (but that's another post). By all means, if you have a board that has groups (and no VCAs) you should use them. They really do make life easier and help you quickly adjust mixes with just a few faders. Even if you have a small band, aggregating inputs down to a single fader makes the job easier. If you have VCAs, however, groups loose their luster pretty quickly. But we'll have to wait on VCAs. As I started writing, I decided that I needed visual aids to illustrate my point. And those take time. Check back in a day or so and see what we come up with for VCAs and DCAs.